I've mentioned in the past that my mom is big on garage sales, especially ones with any garden related treasures.While she was looking, she came across these cool treasures. Jenna got the range finder by Minolta on the left. 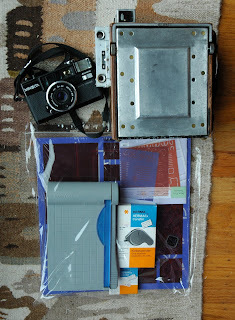 The large box-like camera on the right is a Graflex 4x5 press camera. These were used by the "paparazzi" of the 1930's-1950's. It is missing the grain glass so it isn't working properly. The Creative Memories stuff was at a garage sale two houses down from us. When I saw the herma dotto adhesive runner I made my mom buy it. So glad I did because I broke my pretty purple one on Tuesday! Since I was gone to my retreat during Zena's birthday, we celebrated this past Sunday at A.Sabella's in Fisherman's Wharf. It is closing on November 4th, so it was her last visit. Her mother took her there as a child. It was a beautiful restaurant with a delicious meal. This was our view from the table. 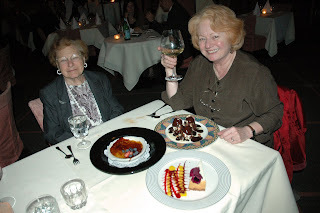 Helen (Zena's mom) and Zena with her birthday desserts. Dan and Linda were also there but I didn't get a chance to take lots of photos. My favorite was the Crème brûlée. On a totally unrelated note, you know you have a Taco Bell fiend in your family when your sister returns home from class at 9:30am stating that Taco Bell didn't open at 9am like they were supposed to. Tonight I had the wonderful opportunity to chat on EBB with Wendy Anderson of Making Memories. I had so much fun asking her lots of questions about getting into the industry. I'm not positive, but I'm fairly certain that when my family went to San Francisco in 2002 that we went to A.Sabella's. And now when I get home from work I'm gonna have to find the appropriate scrapbook and see if I'm right. Lovely finds, Michelle!! I love reading your blog!!! You do so many interesting things!!! Rock on, girlie! 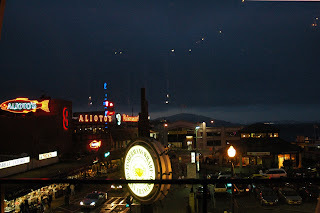 Some tourist photos from D.C.
New member of EBB Creations Design Team!